Hint: It's agile for web. Tired of blowing your budget on a website only to find it doesn't deliver? 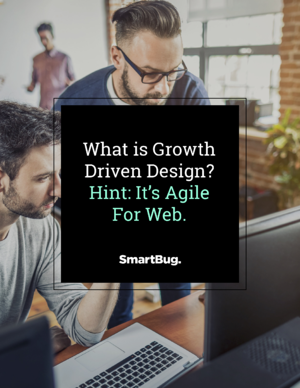 Growth-driven design aims to preserve resources and time, and eliminate wasteful changes through continuous user-driven website improvements. The basics of growth driven design. Why agile for web is effective. The tools and resources to get you started. Get started by filling out the form! © 2019 SmartBug Media, Inc. SmartBug Media, SmartBug, Intelligent Inbound, and the SmartBug logo are trademarks of SmartBug Media, Inc.